Gomez, in the final of the $25,000 Long Beach (Calif.) Futures in January. Collin Altamirano of Sacramento likely will crack the top 500 in the world for the first time after winning a $15,000 Futures tournament in Singapore last week. Altamirano, 22, will rise from No. 562 to an estimated No. 491 on June 11, when the next rankings are released. Seeded eighth, he beat unseeded Takuto Niki of Japan 7-6 (5), 6-3 for his second Futures title. Niki defeated Altamirano's former teammate at the University of Virginia, 2017 NCAA singles champion Thai-Son Kwiatkowski of Charlotte, N.C., 7-6 (3), 2-1, retired in the semifinals. Altamirano also won the Singapore doubles title with Francis Casey Alcantara of the Philippines. The unseeded pair surprised top-seeded Shintaro Imai of Japan and Niki 6-1, 6-4. It was Altamirano's third Futures doubles crown and the 26-year-old Alcantara's seventh. Altamirano will leap from No. 754 in doubles to an undetermined spot. At the end of 2017, he was ranked No. 762 in singles and No. 1,551 in doubles. 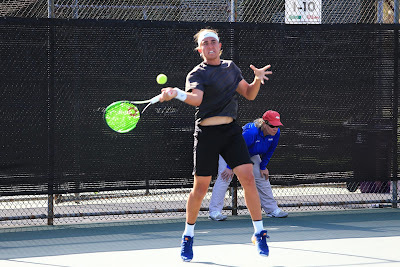 Altamirano became the first unseeded player to win the USTA boys 18 title in 2013 and turned pro last June, forgoing a chance to join Stanford's Paul Goldstein and USC's Steve Johnson as the only men to win four NCAA team titles. Without Kwiatkowski, Altamirano and J.C. Aragone, the Cavaliers lost in the second round of the NCAAs this month.